As you may have gathered, it's been a frantic fortnight in terms of Alcatel IDOL 4 Pro coverage. 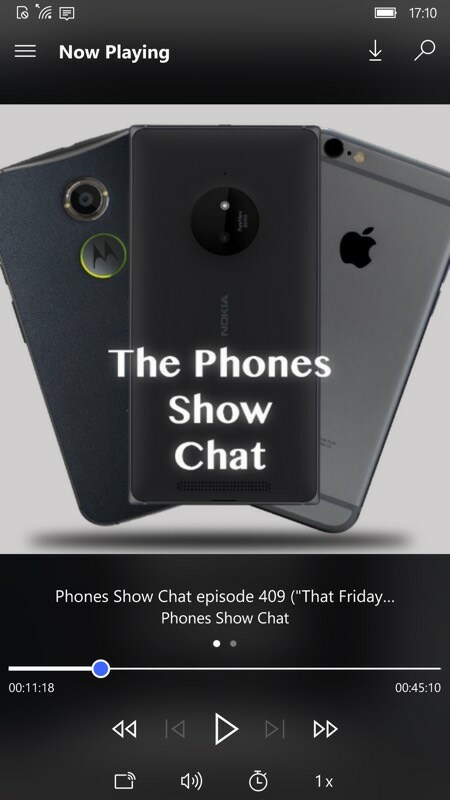 With my review parts 1 (hardware), 2 (imaging), 3 (video and multimedia) complete, plus a comparison with the Lumia 950 XL, it's time for my final review part (for now), summing up the phone's day to day performance and helping you decide whether to actually buy it. Windows 10 Mobile is very familiar to all readers here, of course, from the Start screen interface to live tiles to the Settings and Action Center drop-down. Office, Outlook, Edge, Skype, Groove Music, and so on. In that sense there are no real surprises here, other than finding all this on a 2017 smartphone! 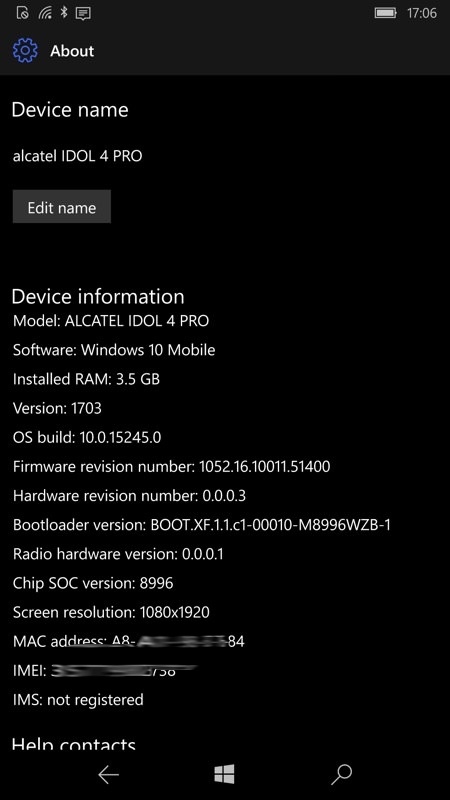 What is curious is that out of the box the Alcatel IDOL 4 Pro ships with W10M Anniversary Update, i.e. 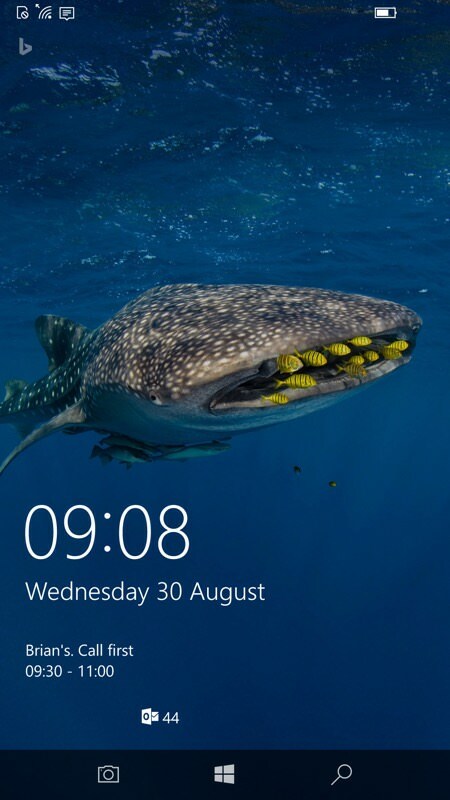 the version of Windows 10 from summer 2016. I suspect that this 'base' is due to commonality with the 'IDOL 4S with Windows 10' that shipped at the very end of 2016 in the USA. But I was expecting that the phone would immediately see the 'Creators Update' (Redstone 2, from May this year) and then we'd be off and running, fully up to date. Sadly no - it seems that Microsoft is still in the process of enabling this update for this Alcatel smartphone, possibly hampered by there still being no 'recovery' image for them in the Windows Device Recovery Tool - so if something went wrong with an update then there would be no way back. My sources indicate that this is happening, but might be a few weeks away. Which is... irritating, and less than satisfactory. Not that this stopped me running the latest and greatest Windows 10 Mobile with the most bug fixes, since the IDOL 4 Pro is enabled for the Insiders programme. So everything here is under the Fast ring and - well, take some of the issues I mention with a slight pinch of salt, even though I've checked them against a Lumia 950 XL on the exact same build. With no WDRT recovery image available, the Insiders programme is a one-way street, though I'm sure the WDRT will be fixed up in due course. In terms of performance, the IDOL 4 Pro is generally as fast as you'd expect, around 30% faster at best over and above the Snapdragon 810-powered Lumia 950 XL. But that's at 'best', for something computationally limiting, such as processing a photo or rendering an email. But for general use, in my tests, the Lumia 950 XL was just as fast. In fact, sometimes faster, especially when loading the same web page or launching a game. Showing that once you factor in optimisation of the internals for Windows 10 Mobile - of RAM, GPU and flash storage - the Microsoft first party phone has had more love and attention shown to it. Hopefully a future firmware update for the IDOL 4 Pro can bring its full potential out, but in the meantime it's like a 5 gear car with fourth gear missing, so it's either working in fifth or third and not 100% consistent. Not quite a speed issue, but worth noting, is that the interface on the IDOL 4 Pro, as on the Lumias, runs at what looks like 30fps - this is fast enough for general use, though does mean that you can't read content as you're scrolling quickly up and down or left and right, whereas many competing smartphones now use 60fps for their interface (the chipsets are easily fast enough), at which refresh speed content is silky smooth when scrolling around. It's a subtle limitation, but one you'll appreciate if you see it. 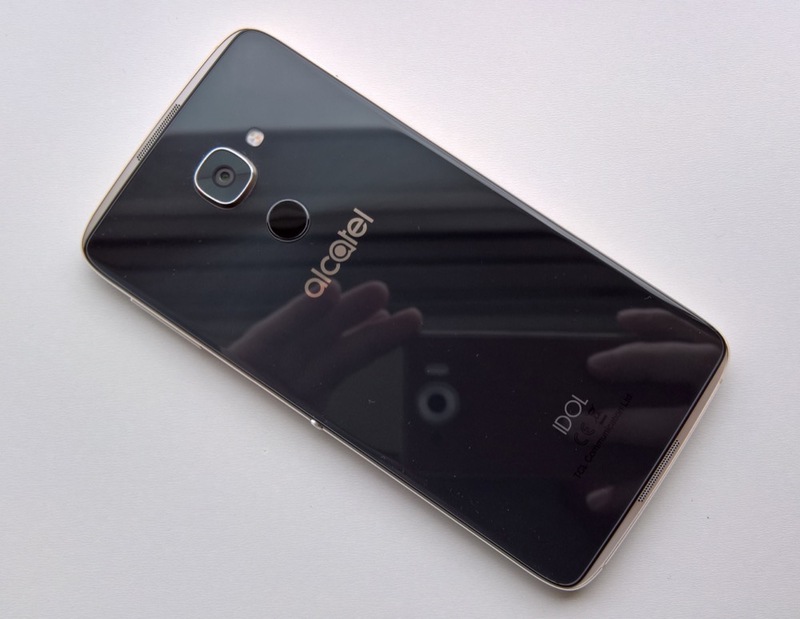 Yet again, maybe this might come in a firmware update, if Alcatel has the will and purpose to sort it out? Also worthy of note is that NFC is MIA, if you see what I mean - go looking for 'NFC' in Settings and it's nowhere to be seen. Which I can't quite believe on a Snapdragon 820-powered phone. Specs analysis UWP reports that NFC is available, the Android version of (more or less) the same phone has NFC, yet it's not in the interface here at all. It's possible that this too is merely disabled in firmware until Alcatel gets round to fixing it. So. Much. To. Be. Fixed. In fairness, there's not much that you can do with NFC under Windows 10 Mobile, but I'd still like the technology to be enabled, pretty please. Although 99% of Windows 10 Mobile is the same as on the Lumias, there are some minor differences of note. 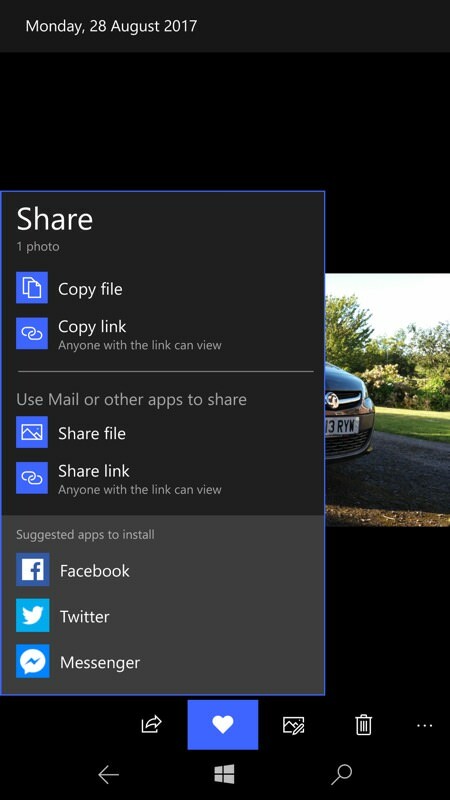 This might be down to the use of Fast ring on a non-Lumia, but when you opt to 'share' something on the IDOL 4 Pro, you're faced with a pop-up, interstitial mini-menu that offers to copy or share the 'file' or 'link' - fair enough, you might think. Except that there's also a 'Suggested apps to install' section, with Facebook, Twitter and Messenger, and it's all too easy to hit one of these by accident, sending the UI off into the Store if you haven't got the offending application installed. Is there a way to turn this pane/behaviour off? I couldn't find one! The 1080p AMOLED screen is stunning, mind you - a real sweet spot for the technology. Here's the third party Grover Pro, with subtle W10M translucency effects, and (right) the Bing Spotlight lock screen in action. A beautiful new image each day, etc. This is where things start to get a little strange, since I've been seeing occasional unexplained 10 second pauses in the interface. Perhaps only once a day or so, but every now and then everything.... stops. I can only think that it's firmware related and something to do with RAM management. Not that other smartphones are all perfect in this regard, but just occasionally it caught me out on the Alcatel IDOL 4 Pro. A similar symptom, though with a different cause and something that's 100% repeatable, is seen in Groove Music. I have about 30GB of music loaded up on microSD typically and, after the usual indexing delays the first time round, Groove seemed pretty smooth. But then I noticed that, the first time you launch Groove after booting/restarting the phone, the first track selected doesn't start playing for a good 15 seconds. The delay is split between bringing the track up on screen and then audio actually starting. 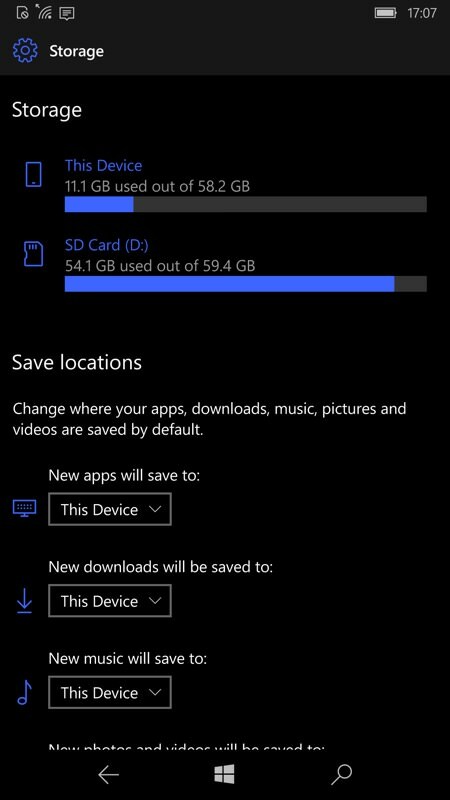 I've tried the exact same music loadout on the same card on the Lumia 950 XL and playback was only delayed after boot-up by a matter of five seconds at most. So, again, there's clearly a lack of optimisation for the Snapdragon 820 chipset or perhaps - again - RAM issues? As hinted in my direct comparison between the IDOL 4 Pro and the Lumia 950 XL, it's hard to make a case for the newer phone unless it's just that - new, shiny, arguably better supported in 2018 - that's attractive to you. Or unless you're fed up with the weedy rear mono speaker on the Lumia and really need the loud stereo affairs here. Or the fingerprint sensor rather than the Lumia's iris recognition. You could look at design and materials, of course, since those are subjective. The IDOL 4 Pro is indeed super-premium in the hand and right up with the 2017 crowd. But, like the competition, you can only really use it when sheathed in plastic, foiling the point of all that glass. 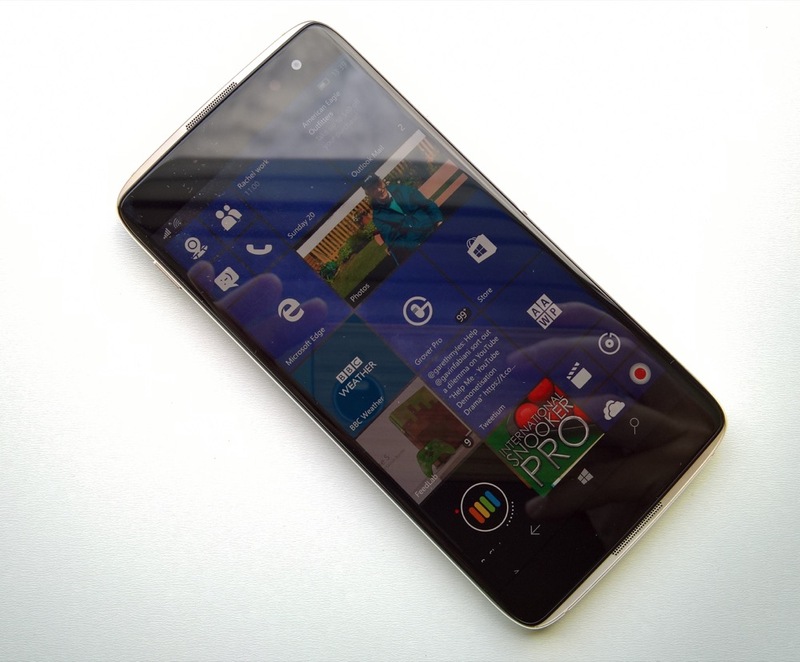 In contrast, the replaceable backs of the Lumia 950 XL start to look rather attractive. Factor in a Mozo wooden or leather back, a replaceable battery (if you can find one) and easier rescue if dropped in water, and again the IDOL 4 Pro might be argued to come off second best. 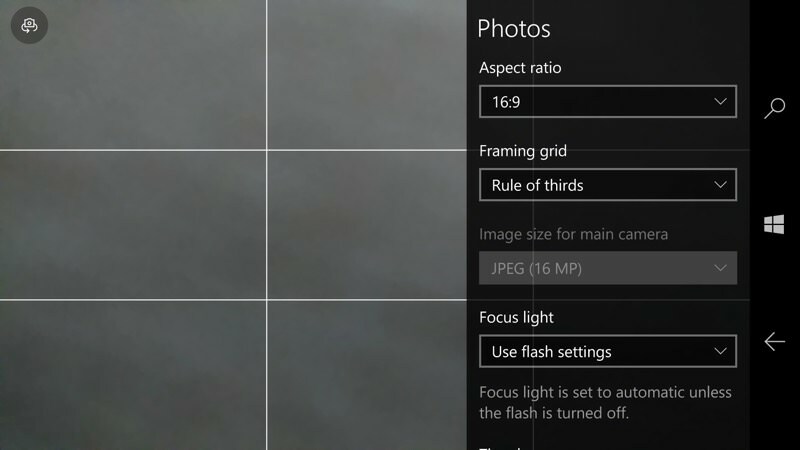 Imaging and even general day to day use are also superior on the Lumia (thanks to better firmware and optimisations). But I refuse to be 'down' on this new Windows 10 Mobile smartphone. After a drought of new hardware in the last two years, only really alleviated by the super-expensive and consumer-disinterested HP Elite x3, we finally have something new to try, new to enjoy (especially if you like your audio) and - with the Snapdragon 820, 4GB of RAM and fingerprint sensor - hopefully better future-proofing. Whatever 'feature2' evolves into, it's a cert that the phones with the 820 chipset will get it at production status, while the older Lumias will probably get left behind. And could the 820 phones also get a sniff at Windows 10 branches in 2018? That alone will be enough to tantalise some readers into buying the IDOL 4 Pro, I suspect.